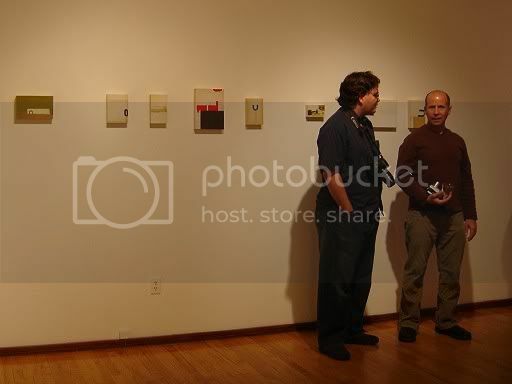 i have a few more shots from the chambers opening to share..thanks to somavenus & chuckvideo for supplying the evidence..
that would be me, chatting paul fujita up, the other solo exhibiting artist. he takes old discarded skateboards and rebuilds them into wonderful constructions that almost look painterly to me. chuck and i just might have to break the piggy bank and add his work to our collection. he really knows his stuff, and if you're anywhere near portland you should check it out..
me and soma...nearly peeing ourselves from all the excitement? 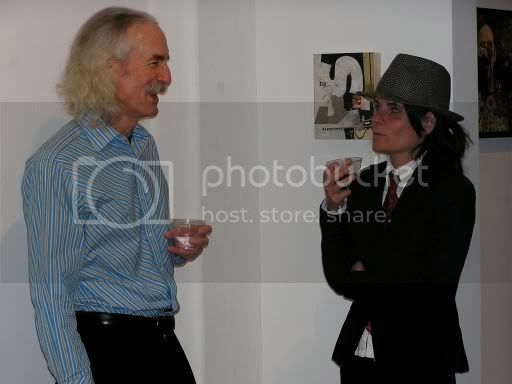 above and below: me and soma chatting up sika stanton, (just out of view, but you can see her in the last photo here) she's also an artist and chambers' directorial assistant. Those all came out great my dear, and I especially like the images of you and Soma. i should've given everyone a disposal like a wedding reception...curses! This is great! I wanted a picture of Chuck and me, and didn't know there was one! Yay! My post is friends locked, so here's the relevant portion! 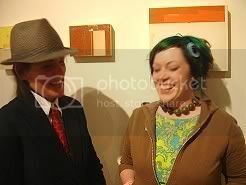 Last night, I saw the work of "Baby Smith", nom d'art of chuckvideo's paramour Becky. 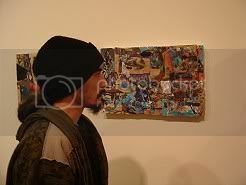 And I was equally impressed by her abstract visions. Becky takes paper products ranging from book pages and covers to wallpaper (correct me if I'm wrong, Becky) and arranges them in beautiful abstract designs that are subtle but cheerful. She uses bright, primary colors in works that make one feel good from the overall psychological effect of the color. But it's more than that. As I said to her last night, I sometimes draw abstractly, so I appreciate that her materials are not simply thrown together on a board or canvas. There is sense, logic, design, and aesthetic harmony there. Everything is arranged to create a cohesive whole, and it works. It is obvious that she really knows what she's doing, and that nothing is random. Her use of letters and numerals is very sparing--one or two per piece. In one case, a blue letter "S" makes the piece stand out powerfully. It's hard to explain, but the letter becomes more aesthetic than linguistic. By removing letters from their normal context, she reminds us of their shapes and designs. Another artist on exhibit at the same gallery works at a shop that either makes or fixes skateboards, and creates works from discarded skateboard pieces that would otherwise only be thrown away, adding silkscreen designs. The range of colors and textures from the pieces, and his designs, results in works that look to me like velour pillows! 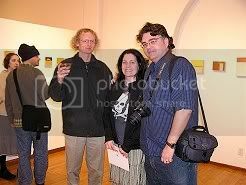 I was THRILLED last night to view the works by these artists. Why? As I said to Becky and Chuck, this represents to me a giant leap forward in our society's intellectual level. Here we have not only the art that takes "something from nothing", as Becky put it, and creates beauty from garbage in some cases (the ultimate recycling! ), but the celebration of that art in a public space! A gallery is celebrating and exhibiting that rearrangement of the mundane into new patterns. This is something that is very new in human history, I cannot but believe. When before have we celebrated the transformation of the old into the new, the beautiful? I equated it to Michelangelo taking new forms out of marble. It's amazing. You must see it. Treat yourself to a collage exhibit sometime. I'm late to the game, but I love it. thanks robert!! 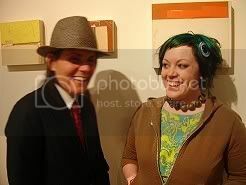 and i'm glad we nabbed a picture of you and the chuckster..
And because EVERYONE'S DOING IT, I'm going to post some of my pictures from the opening as well. Tonight. Soon. you WERE quite the photog that night...gssshh, gssshh, gsssssshhh!!! Hey, waht was Soma's name again--Melanie? She told me, but I forget. Pictures posted in my journal. Looks like fun! I saw some of the web cam shots during the show. That was such a cool idea. yea!! i'm glad you caught the cam...i expect chuck and i'll be going remote more often...LOOK OUT L.A.....you're on CANDiD CAMERA!!!! though, i'm wondering whether the sock bulge was too much? YOU WERE there with me pammy, and always will be...something tells me you'd love portland, though..it's very 'iowa city,' believe it or not. liberal, comfy, walkable and void of plasteek people! i think the collages would just fall flat without a little puff up, yah? it's my way of gussing 'em up a bit..without watering 'em down.